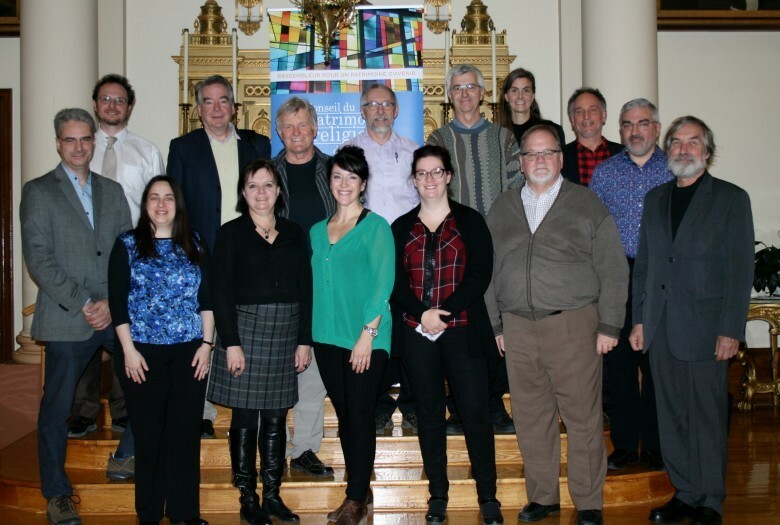 The Québec Religious Heritage Council is administered by a board of directors composed of eighteen (18) directors, one director being nominated by each regional round table, for a total of twelve (12) and six (6) directors who come from active members in general. A director has a three-year term, one third of the seats becoming eligible for re-election each year. From left to right : Claude Lepage, Stéphan Martel, Caroline Tanguay, Pierre B. Paquin, Josée Grandmont, Jean-Marie Fallu, Mélanie Milot, James Sweeny, Marie-Sol Gaudreau, Denis Robitaille, Marie-Julie Asselin, Yves Grondin, Jocelyn Groulx (director), Martin Yelle et Richard Bégin. Absent on the picture: Christiane Barbe, Maurice Bernier, Denis Charpentier and Ghyslain Raza.